A Cooper's Hawk is an accipiter. Accipiters are mid-sized, highly maneuverable hawks that fly quickly among the trees and shrubs looking for prey. Usually small birds and mammals. Other accipiters are the Sharp-shinned Hawk which is smaller, and the Goshawk which is larger. Both the Sharp-shinned Hawk and the Goshawk are uncommon in Orange County, but Sharp-shinned Hawks are seen in the OC more often during the fall and early winter. Above is an immature after an unsuccessful charge into some trees in the garden behind the Huntington Beach Central Park Library. Note the flat head and rounded tail. 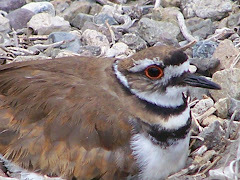 The eyes of the immature pictured above are yellow, but will turn reddish as it matures. The tree it flew into was full of birds which scattered when the immature hawk came barrelling in. The adult Cooper's has almost horizontal orange-brown streaking. The juvenile has vertical brown streaks. The juveniles can be loud when they are recently fledged, and vociferously beg to be fed. 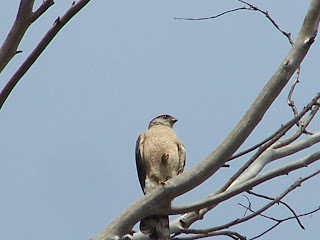 Like many hawks, the Cooper's female is larger than the male. The Cooper's is very similar to the smaller Sharp-shinned Hawk which shows up mostly during migration. 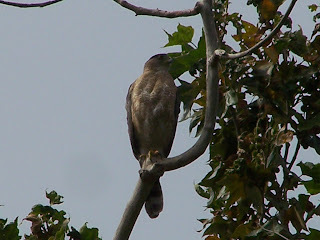 The main differences are the size, the heftier feet of the Cooper's Hawk, a dark cap of the Cooper's versus a hood, and the sometimes seen crest-like feather on the back of the Cooper's flat head. For a good guide to the differences between the two accipiters, see the Cornell University's Project Feeder Watch for a detailed guide to the differences. From the National History Museum of Los Angeles County, CA. Notice the "crest" at the back of the head. 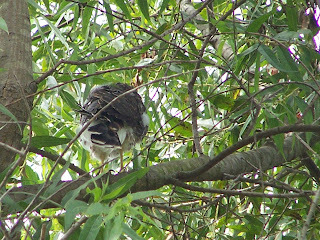 Cooper's Hawks are well-known for protecting their nests. 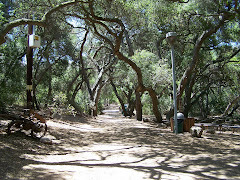 El Dorado Nature Center had to close its two-mile trail this spring (2007) due to a highly protective pair of Cooper's Hawks who swooped down on people walking by and to scare them away from the nest. To protect the hawks and the people, El Dorado Nature Center closed off that section. Below is a shot of a juvenile Cooper's Hawk this August who was calling loudly for its parents at El Dorado Nature Center in Long Beach. Notice the flat top on the head. On the other hand, there was also a Cooper's Hawk nest just outside the fence of Shipley Nature Center in Huntington Beach this summer whose builders endured numerous gawkers who snapped hundreds of pictures. The birds almost seemed to pose for their admirers. And the smaller father who has an unusual mark on his belly. 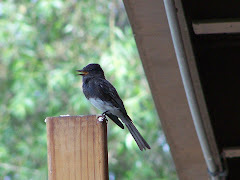 A fledgling with tufts of down still sticking out from between its feathers. Another fledgling watching the gawkers. There are lots of Cooper's Hawks in Orange County, California, so whenever you are at a park, garden, backyard, or any area with a trees, shrubs and birds, watch for them sitting among the branches, or flying quickly through the trees. Any backyard feeder will attract Cooper's Hawks whose main diet consists of birds. If that happens, take your feeders in for about two weeks. The Cooper's will have moved on by then. So when you are out birding watch for the Cooper's Hawk. It is often noisy. Unlike the equally noisy Red-Shouldered Hawk, it has solid wings and a dark cap. Have fun birding in Orange County. Nice video of a Cooper's Hawk. Notice the dark cap rather than a hood that goes down the back like the Sharp-shinned. Great video of the examination of an immature Cooper's Hawk who hit the window of an office building. Note that this post was updated on 12/09/2013. A short, but good articles that describes Cooper's Hawks behavior. Most of these are accurately identified, but be cautious because not all are correctly identified. We used your photo's and info about the Cooper's Hawk to help id one that paid us a visit, twice this March, and used our bird bath! 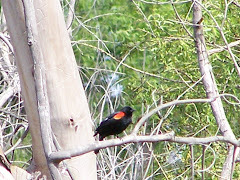 We live just off the Meadowlark Golf Course and have never seen one this close. Thanks for being there. As my nephew Charlie would say, "Excellent!" Glad the pictures helped. Cooper's Hawks are great little hawks. Not as small as American Kestrals--who are downright cute--but smaller than the Red-tailed Hawk and the Red-shouldered. Whenever you have bird feeders, birds, or water, you also eventually have Cooper's Hawks. I had several bird feeders on my patio at my apartment in the San Fernando Valley> One afternoon, a Cooper's Hawk crashed into my lattice during a fast pursuit of a bird. It ended up sitting one of my potted rose bushes. 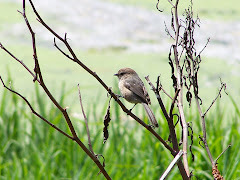 You are close to so many great birding places in Huntington Beach including Bolsa Chica and Carr Park--right around the corner. I am sure you will see lots more bird activity. Again, glad the blog helped. "Excellent." Isn't there a way to safely re-route these Cooper Hawks to someplace else? They decapitate my doves, hummingbirds and pigeons. I never see them eat their prey. They either only attack and decapitate to show their territory or to enforce their superiority. Not once have I seen them consume their prey. They drop the bodies immediatly and the head later on. Since you mention hummingbirds, I am assuming these are birds you are feeding in your yard. I can understand your concern and anger that the birds in your yard were killed. It is natural to become attached to birds we feed. I can tell you that attracting a lot of birds to your yard to feeders you have out will always attract hawks like Cooper's and others that eat birds. It is a natural buffet for the hawks. 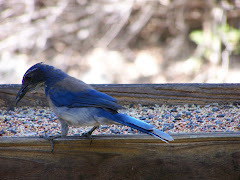 You re-route the Cooper's Hawks by taking in your feeders for a few weeks until the birds go away. The Coopers Hawks will leave in search of other food. Then after a few weeks, put one or two feeders out. Try putting out water or plants that have flowers for hummingbirds. Planting bushes and trees and making sure neither food nor water is far from shelter in case of danger will help as well. You may not attract as many but they may stay longer in the shelter you provide and they will be safer in smaller numbers. 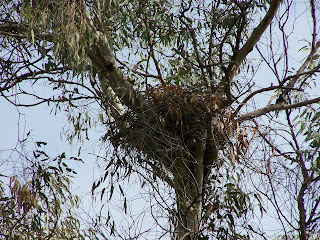 They may even nest. Just to address the bodies you are finding of decapitated birds. Cooper's Hawks and other other hawks rarely leave prey and to my knowledge do not display territorial dominance with prey species such as doves, pigeons, or hummingbirds. I think something else may be happening. 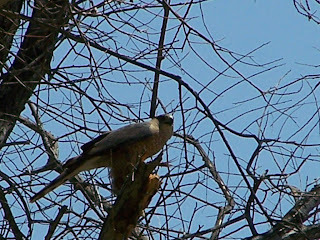 You may want to keep your eye out for things that might be scaring the Cooper's Hawks into abandoning very tasty prey. Another species of bird called a Loggerhead Shrike actually kills birds and hangs them up on fences and sharp branches for later. Loggerhead Shrikes have been know to kill birds as large as Dove or pigeons. 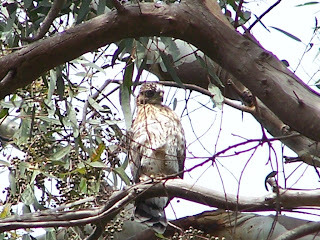 Cooper's Hawks and other hawks are invaluable for keeping down the rodent population. Good luck, I hope this helps.